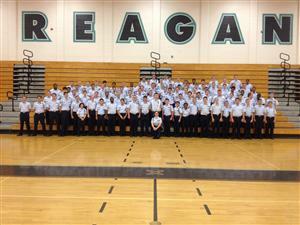 AFJROTC stands for Air Force Junior Reserve Officer Training Corps. Although the club is associated with the U.S. Air Force and cadets are required to don the U.S. Air Force uniform weekly, there is no service obligation after completing JROTC. We are not here to recruit for the military. The purpose of JROTC is to build better citizens, and that is our goal. However, those cadets interested in pursuing a career in the military are afforded a little extra boost upon graduation if they have completed at least 2 or 3 successful years in the program. A "Certificate of Training" is awarded for 2 years and a "Certificate of Completion" is awarded for 3 or 4 years and will allow a newly enlisted member of the Armed Forces to start at a higher rank upon completion of basic training. Additionally, those seeking to become a commissioned officer through a college ROTC program will be allowed to carry over credit for time served in JROTC toward their ROTC commitment. For more information or to contact the instructors for any reason, please come visit Major (Ret) Mark Benyo or TSgt (Ret) Terry Smith in Room 202 or call us at 336-703-6782.